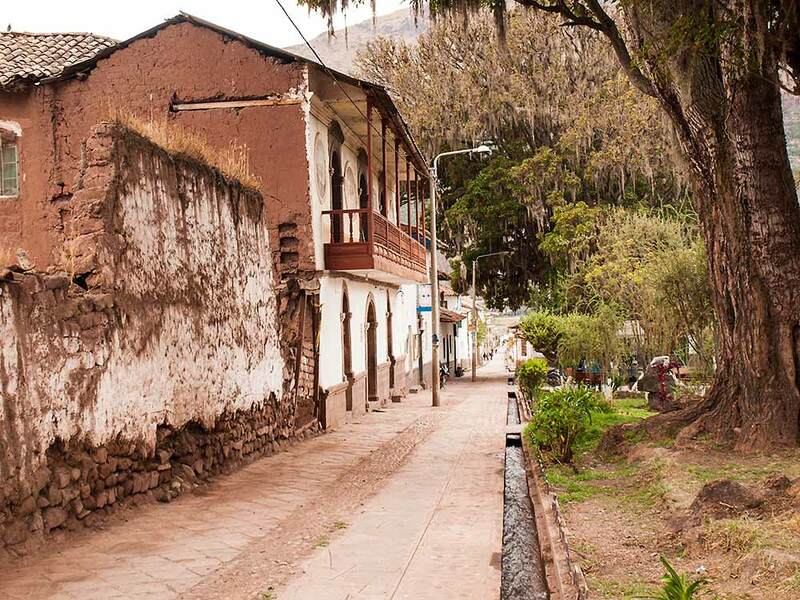 We were just about managing with the altitude in Cuzco, so what did we do next? 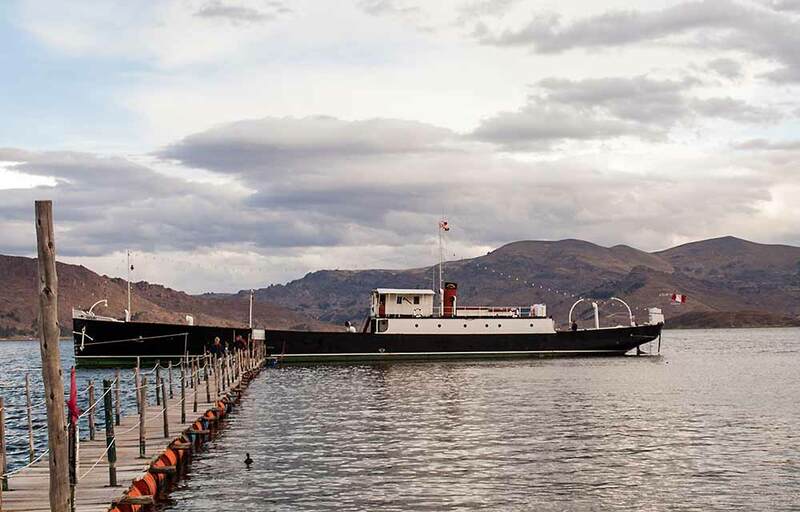 Go to Lake Titicaca - some 300 kms to the southwest and another 500 metres in altitude to cope with! To get there we went on a day-long coach tour, taking in some sights along the way. First was the pretty village of Andahuaylillas, where the church has an ornately decorated interior. The contrast between the simple farming life of the villagers and the gaudy church is striking but no doubt some of the locals thrive on the tourism. 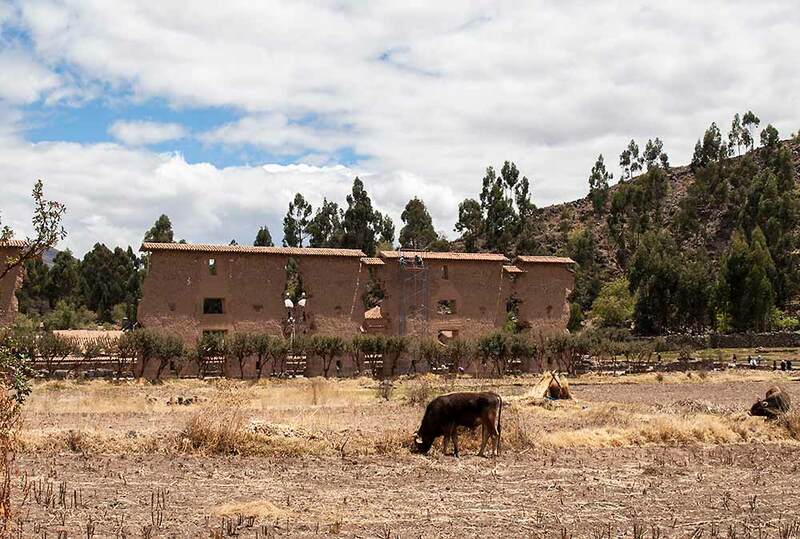 Next site we visited was the Inca Temple of Wiracocha, which was built from a mix of stone and adobe, and no longer has its remarkably large roof. 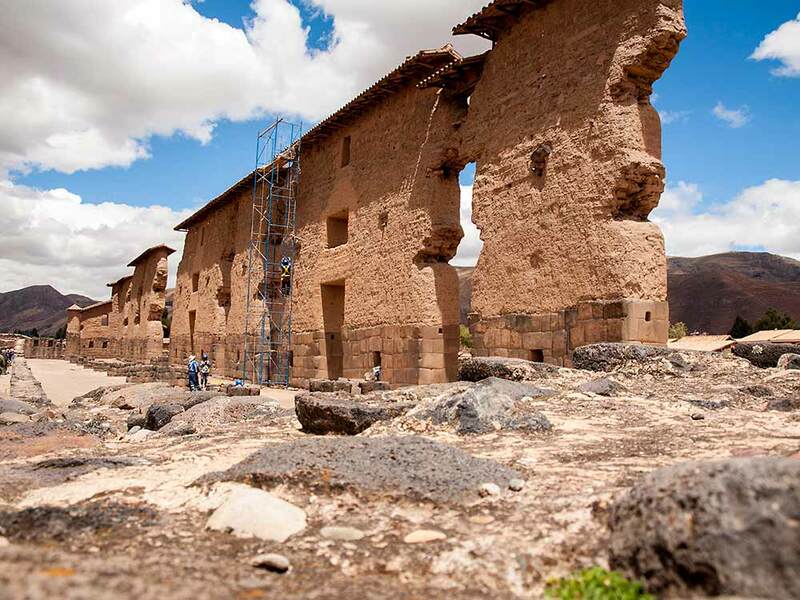 Conservators are hard at work trying to preserve what remains of the crumbling adobe brickwork. 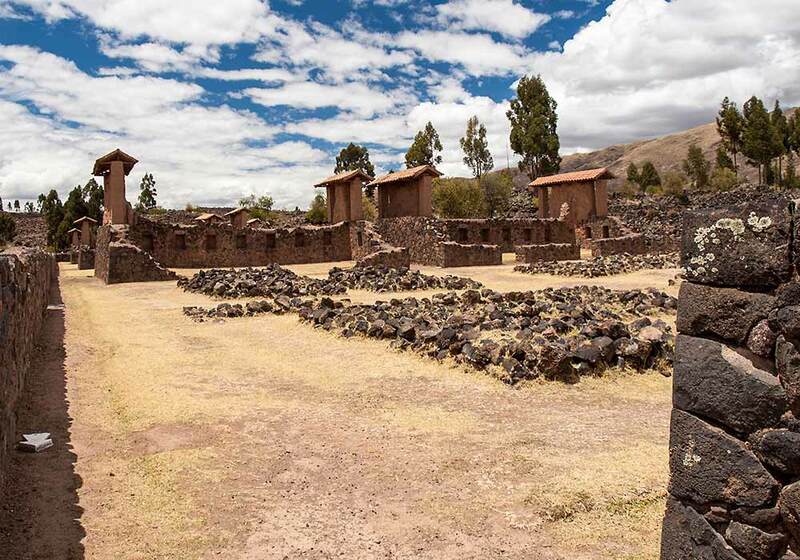 The nearby village of Raqchi is famous for its pottery, though the stuff on sale in the main square wasn't anything special. 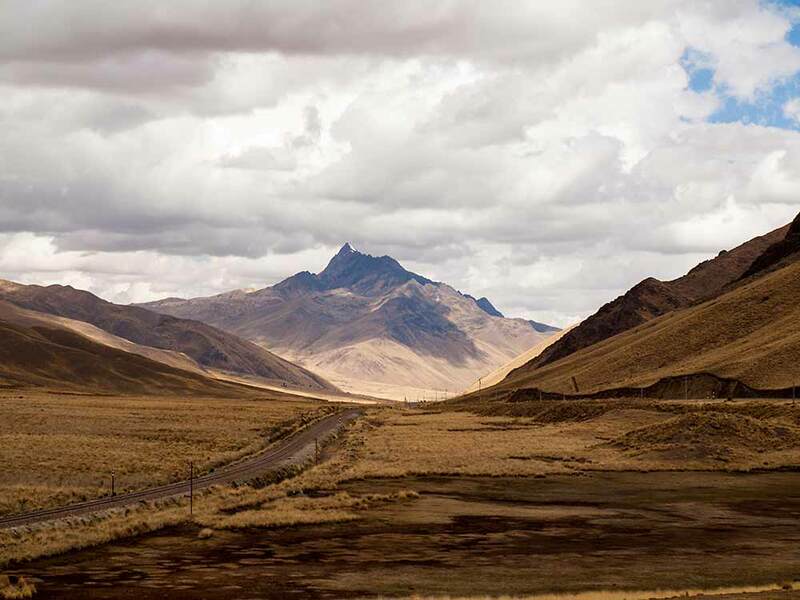 About halfway to Puno - the provincial capital we were heading for on the shores of Lake Titicaca - the road reaches its highest point. 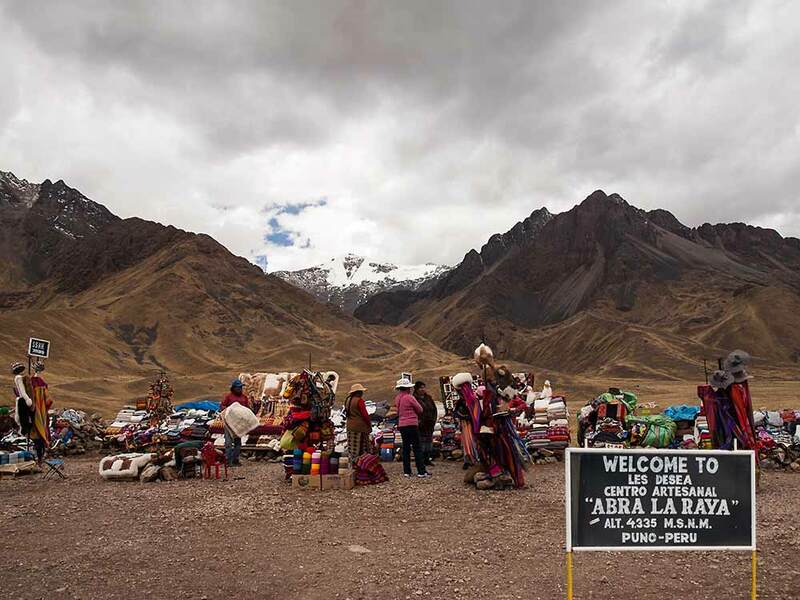 The pass of Abra La Raya at 4,335 metres is unmissable being adorned by a row of stalls selling handicrafts. 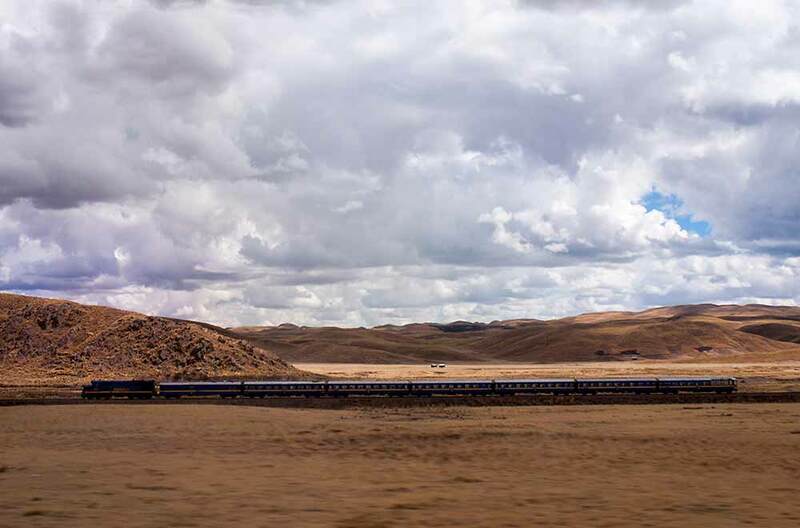 From this point the scenery changed from mostly green pastureland to a much more stark, barren terrain. We were getting tired of being herded tourists, so when the coach stopped at a village called Pukara and we were directed to a small museum we chose instead to visit a shop selling cups of coca tea and ice cream. Pukara is another village of pottery fame and here the pretty pottery bulls that adorn the roofs of houses were much in evidence. We were not sure what to expect but our first view of Lake Titicaca was unimpressive. The part of the lake near Puno is full of reed beds so there's no big blue expanse of water to see. By the time we arrived on the shorefront we were happy to transfer to a taxi for our hotel on the outskirts. Once more feeling the lack of oxygen we had a quiet morning visiting the centre of Puno, finding a nice cafe near the main square but not a lot else. 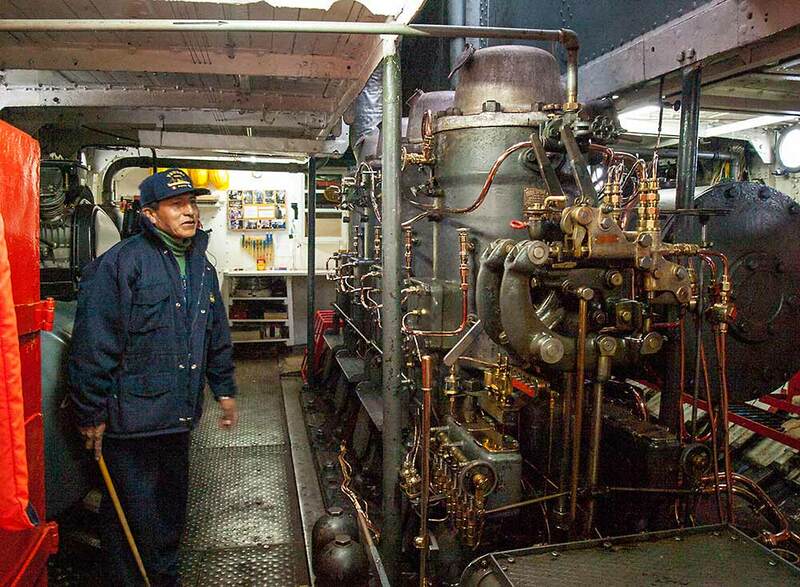 The highlight of our day was a trip to SS Yavari, one of a pair of steamships built in Britain in 1862 for the Peruvian Navy. 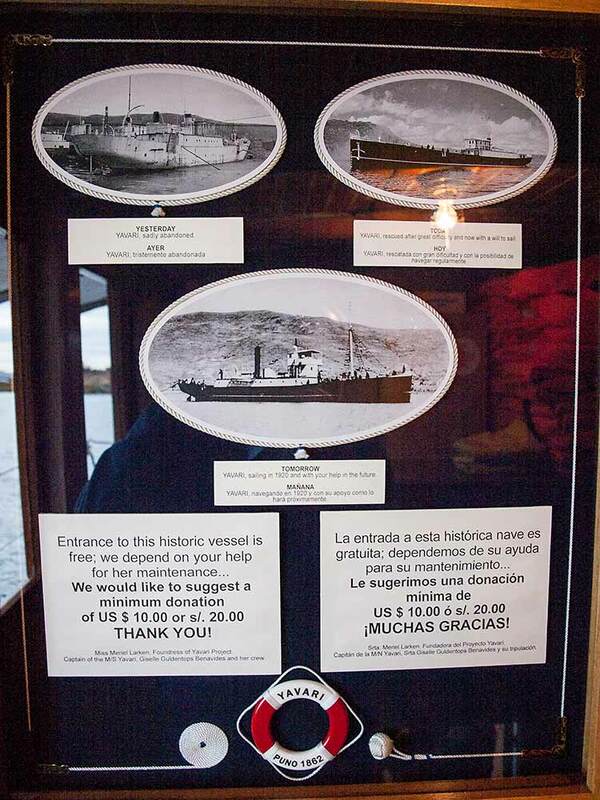 Delivery, in parts, via Cape Horn and overland, followed by assembly, took over 6 years. She was used for policing the drug trade as well as defending the national border, until decommissioning in 1982 when she was left to rust, but has now been lovingly restored and is moored not far from where we stayed. 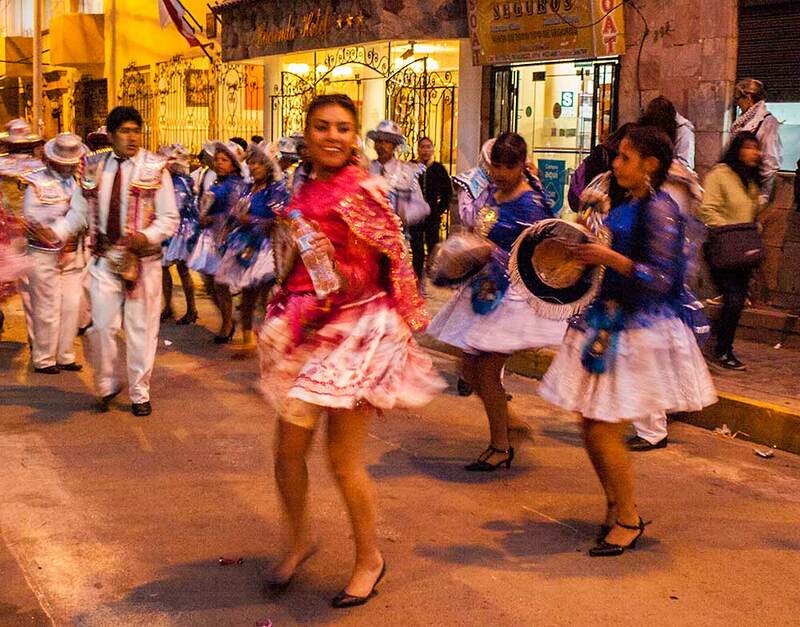 In the evening we went back to the centre of Puno for supper and found the streets loud with music and full of young men and women dancing in celebration of the spring equinox. 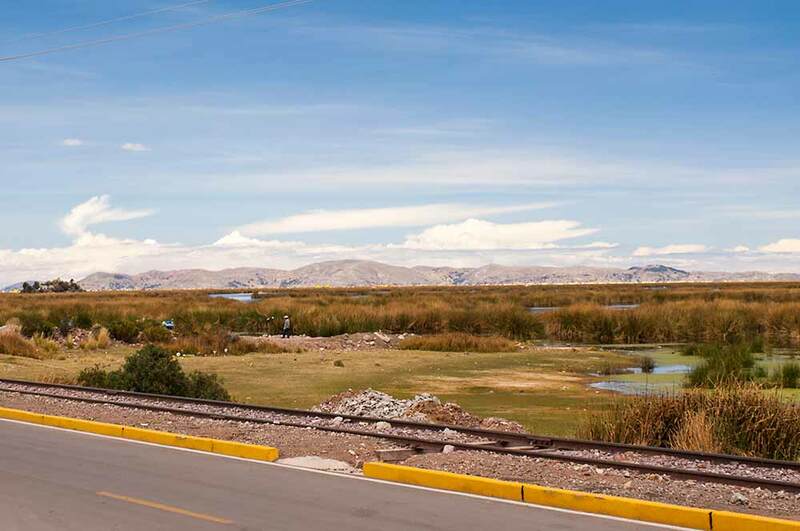 The region of Puno is renowned for its street fiestas - it's like having carnival all year round. Sorry about the focus - it was getting dark!